The awards ceremony for the winners of the All-Ukraine Journalistic Excellence Competition on the “Media, Interethnic Tolerance, and Consolidation of Society” took place at the Teachers’ House in Kyiv last Tuesday. One of the originators and producers of this event was the Association of Ukrainian National-Cultural Unions headed by parliamentarian Oleksandr Feldman. The ceremony was well timed, considering that the social consolidation topic is being discussed at all levels of society. However, few people through their own conduct can actually point to the necessity of supporting every ethnic minority in a multicultural society. Oleksandr Feldman noted that journalists and the mass media that focus on the daily life of ethnic minorities are carrying out a very important mission: they are forming a nation, which is impossible without ethnocultural diversity. Over a period of six months almost 200 works from various regions of Ukraine were submitted to the jury. Presided over by Myroslav Popovych, director of the Ukrainian National Academy’s Institute of Philosophy, the jury singled out six nominations: “Historical Roots of Ukrainian Society’s Ethnocultural Diversity”; “Traditional National Cultures”; “International Relations as Seen through Human Destinies”; “Regional Dimension of International Relations”; “Ethnocultural Organizations on the Map of Ukraine’s Civil Society”; and “Rights of Ukraine’s Ethnic Minorities.” The awards were conferred on journalists representing three media categories: press, television, and radio. Although an award for an Internet publication was envisaged, the competent jury decided not to confer it on anyone this year. This author is happy to note that among the award-winners was our colleague, The Day’s columnist Klara Gudzyk. She was presented with a diploma in the nomination “Ethnocultural Organizations on the Map of Ukraine’s Civil Society,” which she received from Prof. Serhiy Kvit of the School of Journalism, National University of Kyiv-Mohyla Academy of Ukraine. Mr. Kvit noted in his address that “Ukraine is inhabited by a large variety of ethnic groups. Even though all of these have different histories, events such as this competition are helping us build a common future.” Klara Gudzyk thanked the competition organizers and her newspaper, The Day, which, she maintains, has always been willing to carry her feature articles dealing with problems of religion and ethnic minorities. 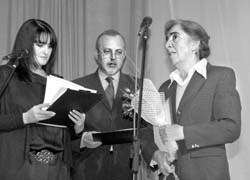 Myroslav Popovych described the competition as a “Festival of Tolerance,” and the event’s festive atmosphere was complemented by a pair of emcees, Ukraine’s noted television hosts Olha Herasymiuk and Yuri Makarov. “It is love for each other that makes us a nation, and it’s especially important that love is the sentiment that began this new epoch in the life of our country,” Ms. Herasymiuk said in conclusion.